No mobile phone reception here – let alone Internet. No dramas getting here either: first, a comfort stop in Donnybrook – and to buy fruit and veges, then lunch in Bridgetown. It isn’t far from Bridgetown to Manjimup, less than 50kms on the South West Highway. The route continues down Muir Highway for a short distance (approx 17kms) before turning into Wheatley Coast Road. The road is sealed right up to the turn-off to Clover Cottage Country Retreat. There is a low stone wall and wooden gate at the front of our picture-book cottage. Sapphire-blue fairy wrens (and the pale grey females) come right up onto the verandah and inspect our every move – in case we drop a crumb or two, so of course we do! Willie Wagtails chase behind and under the sheep that munch on the pasture on the other side of the wall. I watch as they swoop on any flying insect (of which there are many) So far we haven’t had any mosquitoes but the bush flies are friendly. Two dams on the other side of the pasture curve into the contours and further on the Warren River is flowing strongly. Roland can’t wait to wet his line and, even though there is a light drizzle, he is soon out on the water. I’m so happy to see he hasn’t lost his fly-fishing skills. He is a catch-and-release angler so I know I won’t be cooking fish tonight. In the event, Roland caught and released two decent size rainbows. He told me that there are plenty of fish in both dams but they are difficult to catch having been ‘pricked’ so many times. Chironomidsseemed to be the main insect diet and quite a few of these diminutive insects also enjoyed a sip of red wine from my glass! The trout also feed on galaxiids, the minnows that we used to call gillaminkies in Africa. 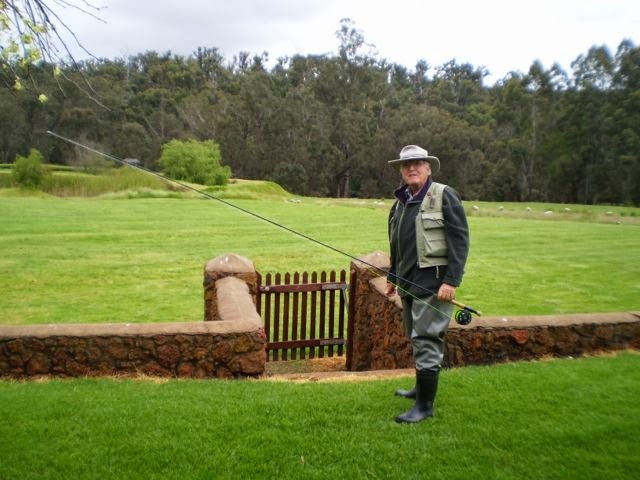 Paul Thomsett, the owner of Clover Cottages, has known Roland for many years and has given him a day on the Trophy Lake for a birthday gift. Roland takes this up and drives to the Trophy Lake which is some distance away. I choose to stay at the cottage. After early morning Yoga practice and breakfast, I go for a walk down to the Warren River. On the way, I take some carrots to feed to Edith and Plonkey. 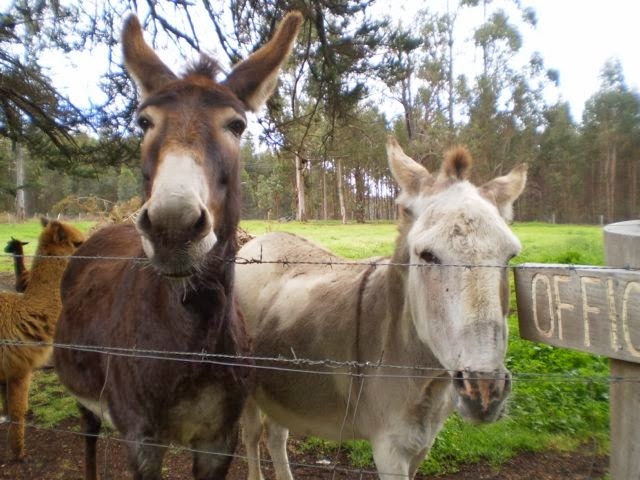 Edith is a beautiful brown French donkey and Plonkey is light grey with darker markings; he is an old fellow. The donkeys see me coming up the track and greet me with their mournful donkey song. There a couple of alpacas sharing the paddock with Edith and Plonkey but they don’t get a look-in when there are carrots being handed out. I’ve brought a broccoli stalk for the chooks but Edith catches sight of it and tells me in no uncertain terms that she loves broccoli stalk! The chooks will have to make do with the few left-over leaves. I was going to give them my apple core but Edith says she’ll have that as well, thank you. Five fat hens clucking, “Hurry up, hurry up” and then turning up their beaks at my paltry offering. This morning I met Floyd, a truly gorgeous golden retriever; he is also known as ‘The Blond Bombshell’. He actually came to bury a bone in the garden of the cottage but, when he saw me, changed his mind and went next door. I practice asana on the verandah with the blue wrens, willie wagtails and other birdlife flitting past me as I stretch and bend. It is warm in the sun, the perfumed wild flowers make me sneeze and I finish off my practice with Yoga Mudra. I continued reading David Mitchell’s Cloud Atlas. Now I’ve finished except for rereading parts that particularly drew me in. I am sorting out the story in my head; analysing and critiquing a (good) book is a habit that dies hard. It is a marvellous story and well told – once I learned how to read it. Thanks to Kim for recommending the book to me. Tomorrow we head off to Albany via Walpole and Denmark. I’m looking forward to catching up with some good friends on the way through.